The village of Balarampur, barely 20 KM from its district headquarters town of Dhenkanal and 80 KM from Odisha’s capital city of Bhubaneswar, has scripted a success story while adopting the methods of the famous Chipko movement to save trees from the vagaries of an allegedly ill planned alcohol plant and bureaucratic insensitivities towards the green. Led by the women folks of the village, it brought wisdom and forced the Odisha government to order for relocation of the project respecting the voice of people, making the case first of its kind in Odisha during the Naveen Patnaik regime. To give a hint, the Chipko movement of 1973 was an organized non-violent resistance, essentially by women of the communities, to the destruction of forests of India in the name of development. It was termed so as people or members of the resisting communities used the method of embracing and hugging the trees to prevent their felling. 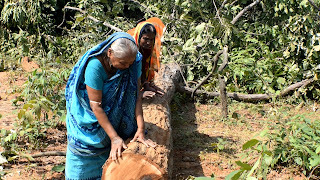 The Balarampur incident of November 17, 2018, left the state shaken when a team of tree fellers equipped with electric cutters felled about 1000 trees during the wee hours under heavy police protection. 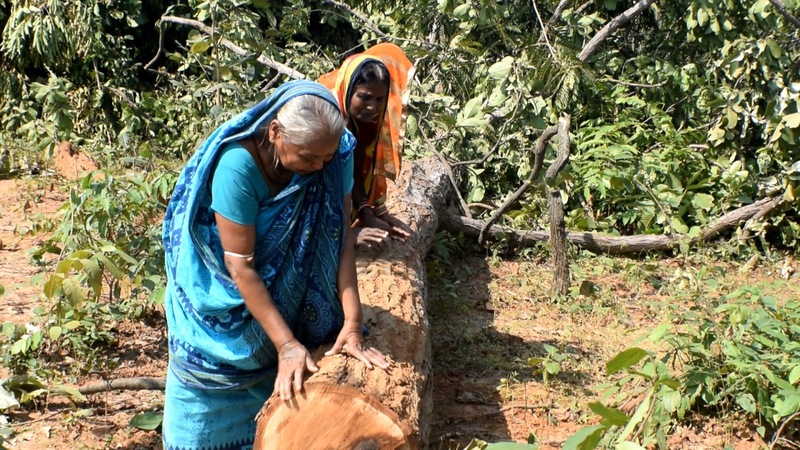 “By the time we knew and reached our forest to save the trees, they had already felled the trees we nurtured like our children,” said Gitarani Dalai, 45, of Balarampur village who happened to be the secretary of the women’s committee for the protection of the forest. “The district administration fixed two earlier dates this month for cutting of the trees but didn’t turn up. This time, on November 17 last, they came at around 4 AM in the morning, not by the road that goes through our village but by taking a different route and started felling trees. As we knew about it in the morning, we rushed to our forest and embraced the trees to protect them from being cut. But the police force overpowered us and pushed us into their vehicle by physically manhandling the women,” she said. The administration was all set to clear the forest on 12 acres of land since the Chief Minister performed the groundbreaking ceremony for a brewing industry of 2.5 lakh hectolitres per annum capacity to be set by Kolkata based P&A Bottlers Pvt Ltd at an investment of 102 crore rupees. However, the project faced strong opposition from the villagers since its approval by the Chief Secretary of Odisha on July 26, 2016. The patch of land proposed for the brewing plant was a part of the 600 acres of well forested landscape bordering more than eight villages and having a variety of plants like Sal (Shorea robusta), Piasala or Malabar kino (Pterocarpus marsupium), Amla (Indian gooseberry), Harida (Terminalia chebula), Bahada (Terminalia bellirica), Mango and many more. Named as Jhinkaragadi, the forest has also been a known habitat of Porcupines, called Jhinka in Odisha, and serves as a passage for wild elephants, according to the villagers. “Our people have planted variety of trees and have been guarding and nurturing the forest since 1972. The forest, however, existed before though not as dense as today,” Dushasan Parida, 75, said in a choked voice while looking at the trees felled by the local administration. “One member each from two of the families living in the village used to guard the forest from morning till the night to keep it safe. These trees were like our children,” said Sakuntala Jena, 33, who lived in the village since last 15 years after marriage and participated in forest protection activities. “We shall rather die protecting the forest but will never allow the alcohol factory to come up on our forest and then spoil our families by encouraging our male members to become alcohol addicts,” Chaturi Sahu, 60, said in a bold voice. The land patch remained Sabik Kisam forest land till 1988 and then was converted to non-forest land and transferred later in Favour of Industrial Development Corporation on Odisha to include in the land bank for industrial development. During transfer, the lands were physically dense forest having various matured timber species. Any patch of the area used for industrial activities would adversely affect the entire landscape. But the administration didn’t bother about all these things no body bothered about these aspects because the land was marked as non-forest land in the recent government records. “As the Forest Conservation Act came into force from 1980 and the entire de-reservation and conversion has been made without approval of central government after 1980, hence it is a violation of Section 2 of Forest Conservation Act 1980. It is also a violation of Supreme Court Order where the Honourable court has clarified that the Forest has to be understood in its dictionary meaning irrespective of its ownership,” said Sankar Prasad Pani, Advocate and Legal Advisor to the Village Committee for protection of the forest who is fighting the case at the National Green Tribunal (NGT) on behalf of the villagers. It’s to be noted that the state government of Odisha is yet to comply with the NGT direction for submission of a report on the status of the land. Instead, in violation of all these norms, the district administration ordered for cutting of the trees when the next NGT hearing was only three days away, according to advocate Pani. “Ordering for and ensuring that the trees are felled in such a massive scale despite public opposition in order to uphold the interests of a liquor industry reflects the kind of apathy from the district administration and the Odisha government towards people’s issues as well as the bigger environmental issues the world is worried about, said Prafulla Samantara, the Green Nobel winner as well as president of Lokshakti Abhiyan, Odisha. Condemning such forceful act of the district administration, Chandranath Dani of Odisha’s Civil Society Forum on Human Rights (CSFHR) said that felling trees while a case on the dispute is being heard by the NGT and, again, in the wee hours of a day without informing people is a violation of citizens’ constitutional rights. As cutting trees in such a scale for a brewing plant drew reaction from all sections, Chief Minister Naveen Patnaik ordered cancellation of the existing lease agreement and, also, for relocation of the project. Earlier, the CM had instructed to stop felling trees and ordered a probe by concerned Revenue Divisional Commissioner. “This is for the first time that the Chief Minister has initiated quick action in response to a movement raised by the community to protect their forest. I hope, this wisdom should sustain and the government should be equally responsive to the voices of people in the state,” said Prafulla Samantara urging further that instead of setting liquor industries the government should envision a dry Odisha. On the other hand, villagers of Balarampur who fought for protection of their forest from the alcohol invasion are happy with the quick wisdom that has come to the CM and Odisha government. But their recent demands include compensation of 15 crore rupees against the damage to the forest and official conversion of the land into community forest land.